Karaoglan (Kartal Tibet) comes from far Asia to Byzantine empire seeking his father Baybora (Reha Yurdakul) whom he never knows. Balaban (Mehmet Ali Akpinar), a devoted friend of Karaoglan accompanies him. Baybora is a despot who forces Byzantinians to pay protection money. Karaoglan and Baybora meet each without knowing who they are. They fight and Karaoglan gets heavily wounded. Also stars Emel Turgut and Sevin� Pekin. 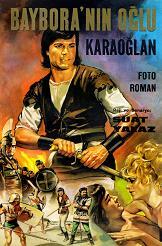 (In Turkish language, with English subtitles).